. gakumonjo 学問所 Academies of Higher Learning . This school for Confucian Learning is quite close to my home in Okayama.It was a place of Confucian Learning during the Edo Period. Shizutani means 'quiet valley', and it's a good name for this place. It's a very isolated valley along the tiny road from Yoshinaga to Bizen. The primary claim to fame of the Shizutani school is that it was the oldest free public school in the world. Mitsumasa Ikeda of the Ikeda clan (daimyo of this area under the Tokugawa shogunate) had the school built to educate the children of the commoners in the province -- not just the children of the samurai class. The other claim to fame of the school, though, is that the Ikedas had bizenyaki potters from the nearby Imbe area create, by hand, the tile roofs for the buildings. bizenyaki is a famous Japanese pottery style which does not use glazes -- the subtle and beautiful coloration is the result of mixing different clays from the area . The resulting rooflines and colorations are beautiful, and I spent several hours sketching the tile roofs at the school. Construction projects had a different pace in those days. Nagatada Tsuda, a vassal of the Ikedas, was assigned to build the school, which he did in the period from 1670 to around 1703. As with Kourakuen gardens, built by the Ikedas in Okayama city, the composition of the views throughout the school is carefully constructed. It was a Confucian school, dedicated to family, respect for elders and superiors, and discipline. In addition to being beautiful, the tile roofs are constructed that even if the first layer of tiles crack, no water gets through the roof. No doubt lots of students got their knuckles bloodied in the main lecture hall for looking outside instead of at the teacher. The Ikedas declared that only charcoal was to be used for fuel here so that the ceiling would not be darkened by soot -- and 300 years later, they're not. In 1666 (Kanbun 6), Lord Mitsumasa Ikeda of Bizen visited a quiet place at Nobuhara Kitahashi in Kidani, Wake-gun on a inspection tour of his domain. He immediately thought of building an educational utopia, a large-scale learning place for common people. In order to realize an ambitious idea of his own, Lord Mitsumasa opened a learning place in 1668 (Kanbun 8). In 1670 (Kanbun 10), his chief retainer Nagatada Tsuda began to build a full-scale construction and changed the name of the place to Shizutani. Lord Mitsumasa was so enthusiastic about building the school that he made arrangements for the school to be able to manage independently even if the Ikeda family had to be relocated. The school building was roofed with Bizen Pottery. To provide the roof tiles, he took the trouble to build a kiln nearby and brought potters from Imbe area. His enthusiasm was inherited by his successor Lord Tsunamasa. The existing school facilities were completed by Lord Tsunamasa and Nagatada Tsuda in the Genroku years. However, the design and construction technology still has not lost its splendor. The school accepted not only common people and samurai children in the domain but also people from other domains. The spirit of Lord Mitsumasa and Nagatada in building the school continued uninterruptedly, offering many opportunities for scholars and literary people like Raisanyo. The Shizutani School and the other domain school in the Okayama Castle town were the two leading educational institutions in the domain, and their history and tradition continued even in the Meiji Period, producing many able people to date. It was established in 1686 (Teiho 3) to honor Lord Mitsumasa Ikeda, the founder of the Shizutani School. The shrine is also known as Higashi Mido compared with the Holy Mausoleum in the west. 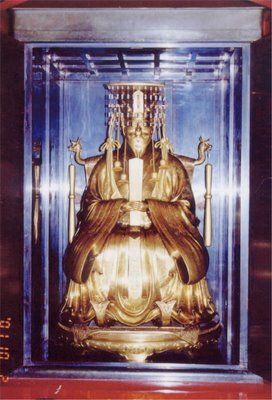 There is a shining gold Lord Mitsumasa statue inside the shrine. The shrine was built 1-meter shorter than the Holy Mausoleum, there by expressing his respect for Confucius. It is known as Nishi Mido compared with the Higashi Mido. The magnificent pair of Kai trees stand symmetrically on both sides, creating the beauty suitable for the holy name. Daiseiden, which is equal to the main building of a shrine, has hexagonal pattern Bizen Pottery roof tiles on the floor in order to prevent leakage for many years. This is one of the many careful construction techniques used in the building. The Holy Mausoleum still holds the gold Confucius statue inside. Designated as a national treasure, the auditorium is the largest building of the Shizutani School as well as the main classroom. 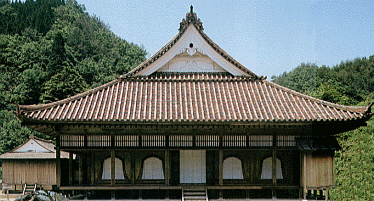 It was built with good wood such as zelkova, cedar, camphor and others. Black lacquer was applied to the parts that are likely to weather. The auditorium was built to perfection under careful design from the foundation to the roof. The floor panels are still as shiny as mirrors. There are a pair of Kai trees standing on both sides of the stone steps that lead up to the Holy Mausoleum. The one on the left has leaves turning crimson, and the other on the right has leaves turning yellowish light vermilion in autumn. In early November, many tourists visit here just to see this autumn foliage. These Kai trees sprouted from seeds brought from the Confucius Mausoleum in Shandong, China, and they are called the "Trees of Academics" based on Confucius. This was a rest house for the lords while visiting the Shizutani School. With its hipped roof, the simple building has a tasteful atmosphere, like a tea ceremony room. This is a tea ceremony room to entertain school visitors such as scholars and literal people from other domains. The name, Koyo-tei, was taken from a poem by Teika Fujiwara. When Raisanyo visited here, he praised the scenery highly and wrote the "Koyo-tei Memories". Also known as the Tsubaki-dani, the holy place stored the school founder Lord Mitsumasa's hair, beard, nails and so on after his death. The wall surrounds the entire Shizutani School from one side of the school gate to the other. Each stone panel made of aqueous rocks is about 1.9-m wide and 2-m high, and chiseled into a semi-cylindrical shape. (The total length including the Tsubaki-yama is 846 meters.) Ever after 300 years passed, any single weed, have not grown on the wall. This is a rectangular pond 7-m wide and 11-m long that runs parallel to the stone wall. It was modeled on a school in ancient China. © 2005 Bizen City All rights reserved. for Confucius or other deified persons.
. 足利学校 Ashikaga Gakkō, The Ashikaga School .